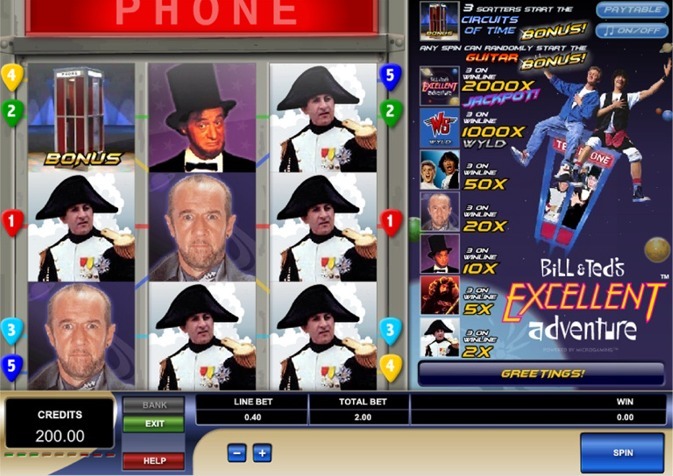 Bill and Teds Excellent Slot is an unusual 3-reel, 5-line game with plenty of excitement and features that mimic the hugely popular 1989 movie. The slot features a cool cascading style phone box reel layout, 2 very rewarding bonus rounds, plus a mass of realistic imagery and sound effects taken directly from the hit movie. The vivid supporting graphics should also be mentioned along with the crisp animation, which have been used to full effect by top developers Microgaming. Boasting a respective maximum pay out of 2000x, the game should appeal to fruit machine and slot lovers alike. The slot includes a variety of symbols relating to the hit movie, with the bonus rounds also mimicking the popular scenes and quotes. The Wyld Stallyns acts as a wild symbols, substituting for any other symbols, and hitting three of these on any active payline rewards players with 1000x multiplier. This seems relatively large considering there are only 3 reels and must be considered when choosing a slot that offers a fairer game. It must be noted though that the 5-payline structure cannot be altered, so the staking is changed through the size of the coin amount per spin. To activate the excellent “Circuits of Time” bonus round, three Phone Box Bonus symbols must scattered anywhere on the three reels. This bonus round is a great interactive game with plenty of opportunities to bag some serious cash. The aim is to accumulate as many winspins as possible by shooting as many planets within the time period. This is a truly great bonus round, incorporating great sound effects and animation to capture the time travel through space Bill and Ted experienced in the movie. When a planet is hit, the game rewards players with a random number of winspins, meaning a large amount can be accumulated in a single round of this enticing bonus round. The aptly named “Guitar bonus game” is randomly activated, regardless of stake. When triggered, players can win up to 2000x multiplier on the value of their total stake for that spin. This bonus feature is like those you’ll find on classic fruit machines such as Reel King or Deal or No Deal. For anyone who loves fruit machines or old school movies, this classic combination is definitely for you! We reccomend playing the Bill and Ted slot at Ladbrokes or 32 Red casino.We highly recommend both of these casinos, as each has over 30 UK style fruit machines. Read reviews of 32 Red and Ladbrokes here.